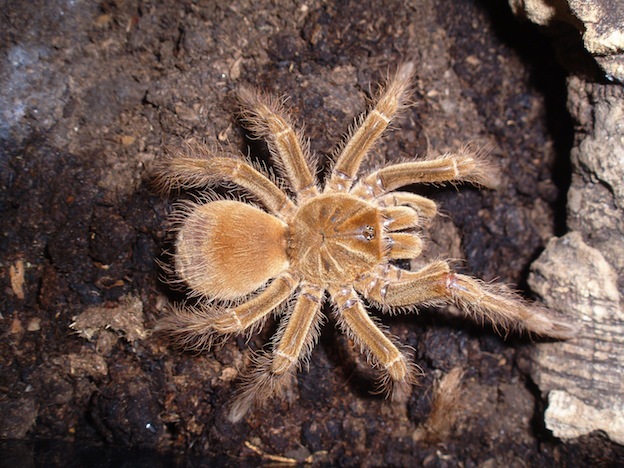 The Goliath Bird-Eater Spider is actually one that belongs to the Tarantula group. It is the second largest spider in the world when you look at the legs of it. Many experts claim it is the largest too due to the overall mass of it. This Spider was named early on by explorers. They happened to see one eating a Humming Bird. The leg span can be more than 12 inches. They often have brown coloring that may be light or dark. It depends on the location where they live. They have a great deal of hair covering them. These hairs can be dangerous for humans to breath in. There can be dark stripes on the legs. The rainforests of South American are the native locations for the Goliath Bird-Eater Spider. They live in burrows that they dig or that other animals have left behind. They tend to enjoy the wetter areas such as swamp lands. This is very aggressive type of Spider when it comes to territory. You don’t want to have more than one of them as a pet in the same location or they will bitterly fight each other. They can be very fast and very nervous. You want to avoid touching them too. Their hairs can make your skin very irritated and their fangs are dangerous. They are one of the few species of Spiders that are known to make a type of hissing noise. They do so by rubbing their legs together. Such a sound is a strong indicator that the Spider feels threatened. They aren’t going to retreat and run away so it is best if you leave them alone at that point. Even though the Goliath Bird-Eater Spider got its name from eating a bird, they rarely are seen doing so. They typically will consume all types of insects. They are larger sized Spiders though so they will also eat rodents, snakes, bats, and lizards too. They will take the opportunity to eat whatever comes along. They are often given a diet of cockroaches when they are in captivity. The females tend to eat much more before mating. This is because once they have their egg sack in place they won’t continue to eat. They will focus only on protecting the young so that they can survive. The males are going to be attracted to the female due to the chemicals she offers. There can be several males aggressively fighting with each other in order to earn the right to make with her. The females may be very picky when it comes to a mate. However, one thing is certain – they don’t kill the male that they do mate with, like other spider species. Up to 200 eggs can be deposited by the females. The young will arrive 8 weeks after mating has taken place. This particular Spider is believed to be harmless to the human. They can bite if they feel threatened. The bite can also break the skin. However, the venom isn’t very strong so most people won’t have any irritation from it. The bite will feel similar to a bee or wasp. This particular Spider is one that is very popular in the exotic pet trade. However, they can be very expensive due to the fact that they have to be brought in from another country. Only limited pet stores have them but they are often sold illegally on the black market.